Osumanu Adama failed in his bid to become Ghana’s ninth boxing world champion after losing unanimously to IBF middleweight champion, Daniel Geale in Australia on Wednesday. The score cards read 117-111, 115-113 and 118-110. Ring side reports indicate that Geale outworked Adama to earn the victory. By this result Osumanu Adama now has three losses in 23 professional bouts. With the victory, Geale is seeking unification bouts with champions, Dmitry Pirog (19-0 15 KOs), Julio César Chávez Jr. (45-1-1, 31 KOs), Felix Sturm (36-2-2, 15 KOs) and Ring Magazine titlest Sergio Martinez (48-2-2, 27 KOs. “A move to the U.S. could be next for me,” said Geale. “My promoter Gary Shaw is eager to get me some big fights with all the champions at middleweight. I have confidence in my ability to unify the titles and become the best middleweight in the world. I feel great right now and I’m extremely happy knowing big opportunities await me. My career is headed in the right direction and I’m looking forward to my next fight, whoever it may be. “Sky is the limit for Daniel,” said an elated Gary Shaw. “Right now the goal is to bring Geale to the U.S. for a big fight on network television. He’s earned the right to fight any of the current champions at middleweight. Daniel is a fantastic fighter and I see him becoming the undisputed champion at 160. When I get back to the states, I will put everything in motion. A great evening for Australian boxing was capped off with local champions Daniel Geale and Billy Dib retaining their IBF world titles. 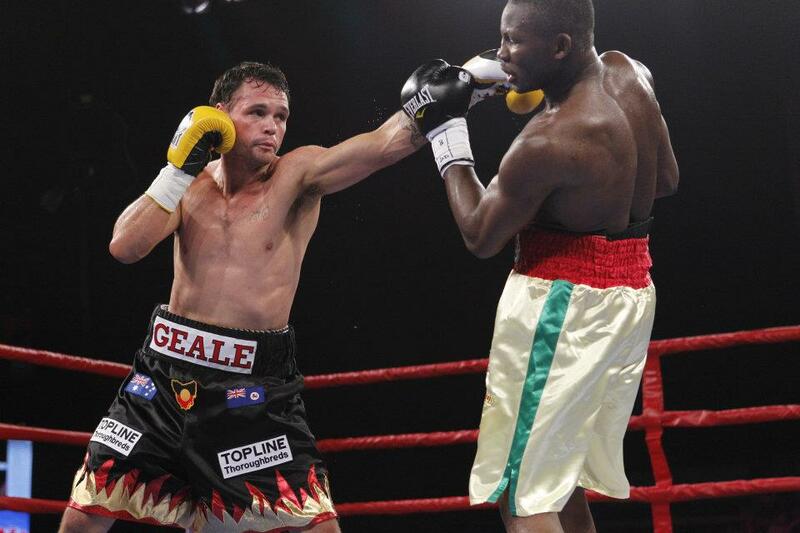 Daniel Geale received a unanimous points decision of 117-111, 115-113 and 118-110 against Ghana’s Osumanu Adama in his home state of Tasmania, while fellow Aussie Dib’s ferocious assault forced his opponent Eduardo Escobedo to throw in the towel before the start of the seventh round. In the Geale fight Adama started with intent, rushing out to throw an opening right hook with which Geale responded in kind. The opening affair was a cagey affair, as both fighters sounded each other with quick jabs. The Tasmanian took the second round with some good combinations and fancy footwork keeping him out of Adama’s range. In the middle rounds Geale increased his tempo and kept up the pressure, unleashing some good body shots on the African. Adama fought back in the fifth and sixth rounds, winning those, but Geale kept up his workrate in the later rounds to get ahead. As the bout progressed Adama retreated and Geale attacked, the champion stalking his rival around the ring. Geale seem frustrated in the eleventh round, saying something to Adama, but it was the younger fighter who slipped in this round and continued on the backfoot. Geale increased his scoring leading in the final round, doing enough to ensure he would get the decision against the elusive Adama. Billy Dib lived up to the promise of his trainer Billy Hussein that he wouldn’t run from Escobedo, starting the fight by charging in and setting the tone early. Dib wanted to dominate the Mexican, and he did so from the opening bell. Cautioned for a low blow in the first, the referee had a large impact on this fight, intervening on several occasions to warn both fighters. But Dib would not be deterred, the pumped Sydneysider leading Escobedo into the ropes repeatedly and working for a knockdown. Escobedo landed some good body hots in round three but this didn’t stop Dib, the 26-year old firing some huge body shots of his own in an ultra-offensive manner. Dib continued to stalk the Mexican in the fifth, dazing Escobedo with several punches, and normal service continued in the sixth. Dib reined in more telling punches but the sixth round ended in controversy as Escobedo threw a late punch after the bell had sounded. This proved to be Escobedo’s last punch in anger for the night though, as the 28-year threw in the towel before the seventh round started. Dib’s onslaught proved to be too much for the under-fire Mexican challenger. Australian heavyweight Kali Meehan succumbed to a sixth round masterclass from his American opponent Travis Walker. Fighting for the IBF Pan Pacific belt Meehan started solidly, winning at least two of the opening three rounds. Walker started attacking in the fourth but Meehan fired back with a huge left hand. The fifth round was much closer but it was all over in the sixth as Walker tellingly found his range. The American landed some huge blows, ramping up his assault on the more experienced Aussie and working him on the ropes. Meehan began wobbling and as Walker’s assault became more intense Meehan’s corner threw in the towel. Meehan might have been leading on points at the start of the sixth but Walker finished off the fight with an intimidating 120-second blitz. Local boy Steven Maxwell faced NSW’s Alex Ahtong in the fourth fight of the night, with Ahtong keen to avenge his defeat to Maxwell two years ago. And he did just that with an impressive first round spell, Ahtong using his height and reach well to trouble the Tasmanian. Maxwell went down but survived the count and made it to round two. Maxwell showed heart in the next two rounds but went down again, in the third, as Ahtong used his left hand at will. Both fighters went toe-to-toe in the fourth, with Maxwell putting everything into it, but Ahtong protected his lead and survived the six rounds to get a unanimous decision victory. Another Tasmanian was up in the third bout with experienced boxer Frank Ciampa fighting light heavyweight Steve Lovett. But it was the man from Canberra who proved too strong, Lovett improving his unbeaten pro record to five wins from five fights. The referee stopped the contest one minute and 29 seconds into the sixth round, after Lovett had clearly dominated the third and fourth rounds. Ciampa fought back bravely in the fifth, but the Graham Shaw-trained Lovett continued his barrage and put Ciampa down in the sixth with a great punch. Lovett continued to land shots at will and the ref stepped in to stop it, and award the bout to the up-and-coming 26-year old. Promising Australian featherweight Cory McConnell took on Robert Lerio and notched a 60-55, 60-54, 60-54 points victory in this one. The talented McConnell showed a nice jab and some tidy combinations in a win that never really looked in doubt. Filipino Lerio showed heart but McConnell boxed expertly and added another scalp to his rising career. NSW light heavyweight Aaron Lai needed just 88 seconds to finish off Queensland’s Judd Cornwall in the first fight of the card. A lovely left hook from Lai put his opponent down and Cornwall could not continue. Lai’s record moves to three wins from three fights for the 28-year old Sydneysider. Corey McConnell def Roberto Lerio via UD (60-54, 60-54, 60-55). Aaron Lai def Judd Cornwall via KO, Round 1.